Can CMK 2013 Get Any Cooler? With four days of project development supported by an amazing faculty, a trip to the MIT Media Lab and guest speakers like Eleanor Duckworth, Deborah Meier, Tod Machover, and Dale Dougherty you would rightly conclude that Constructing Modern Knowledge 2013 promises to be the greatest professional learning event of the year. Our faculty includes the inventors of Logo, programmable LEGO, MicroWorlds, MaKey MaKey, and Scratch – in addition to brilliant educators, including the first teacher in the world to teach in a 1:1 classroom. We have a ton of microcontrollers, LEGO, electronics, software tools, cameras, toys, wearable computing elements, gadgets, supplies, conductive paint and robotics materials all ready for use in projects. Creative educators are coming from at least a half-dozen countries and registration is at an all-time high! In the spirit of “nothing succeeds like excess,” I am thrilled to announce the addition of two guest speakers! Constructing Modern Knowledge 2013 is proud to feature a masterclass by legendary musician Jimmy Heath and Emmet Cohen! Jimmy Heath’s latest recording is Endurance with the Heath Brothers and his critically-acclaimed book, I Walked With Giants: The Autobiography of Jimmy Heath, is available in hardcover and Kindle versions. Emmet Cohen’s debut CD, In the Element, will be followed by a sophomore recording later this year featuring Brian Lynch, Boris Kozlov and Billy Hart. At CMK 2013, Heath and Cohen will play and discuss improvisation, the artistic quest for excellence, learning on the bandstand and their lives as jazz musicians. 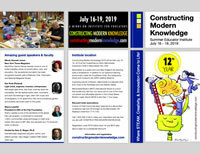 You do not want to miss this very special event at Constructing Modern Knowledge 2013. A small number of places are still available. Register today! Check out some of the clips below to get a sneak peak at what you’ll hear & see at CMK 2013! Jimmy Heath embodies the history of jazz. In his 60 years on the jazz scene, the saxophone great has appeared on more than 125 records as both a composer and player. Heath grew up in Philadelphia alongside brothers Percy and Tootie, both renowned jazz players in their own right, and is the father of Mtume. He has performed with nearly all the jazz greats of the last 50 years, from Howard McGhee, Dizzy Gillespie, Sonny Rollins, and Miles Davis to Wynton Marsalis. In 1948 at the age of 21, he performed in the First International Jazz Festival in Paris with McGhee, sharing the stage with Coleman Hawkins, Slam Stewart, and Erroll Garner. One of Heath’s earliest big bands (1947-1948) in Philadelphia included John Coltrane, Benny Golson, Specs Wright, Cal Massey, Johnny Coles, Ray Bryant, and Nelson Boyd. Charlie Parker and Max Roach sat in on one occasion. During his career, Jimmy Heath has performed on more than 100 record albums including seven with The Heath Brothers and twelve as a leader. Jimmy has also written more than 125 compositions, many of which have become jazz standards and have been recorded by other artists including Art Farmer, Cannonball Adderley, Clark Terry, Chick Corea, Chet Baker, Miles Davis, James Moody, Milt Jackson, Ahmad Jamal, Ray Charles, Dizzy Gillespie. Lee Morgan, J.J Johnson and Dexter Gordon. Jimmy has also composed extended works – seven suites and two string quartets – and he premiered his first symphonic work, “Three Ears,” in 1988 at Queens College (CUNY) with Maurice Peress conducting. In 1993, he performed as part of the inaugural celebration for President Clinton at the White House Jazz Festival. After eleven years as Professor of Music at the Aaron Copland School of Music at Queens College, Heath maintains an extensive performance schedule and continues to conduct workshops and clinics throughout the United States, Europe, and Canada. He has also taught jazz studies at Jazzmobile, Housatonic College, City College of New York, and The New School for Social Research. Jimmy Heath has been awarded three honorary doctorates and countless other distinctions. At 23, jazz pianist Emmet Cohen, a finalist in the 2001 Thelonious Monk International Piano Competition, plays with the maturity and confidence of a seasoned veteran. His many awards include three Downbeat Student Music Awards for Best Jazz Soloist and Best Jazz Combo. Cohen has shared the bandstand with musical luminaries, including: Christian McBride, Joshua Redman, Patti Austin, Maceo Parker, The Dizzy Gillespie All Star Big Band, Joey DeFrancesco, Phil Woods, Brian Lynch, Larry Coryell, Jimmy Cobb, Carmen Bradford, Billy Hart and many others. He holds a bachelors degree in music from the University of Miami and is currently a Masters student at the Manhattan School of Music. Emmet regularly appears as a sideman and leader on both piano and Hammond B3 organ in NY, Miami and major jazz festivals around the world.